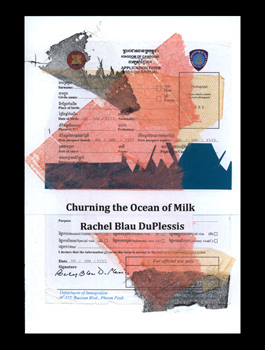 This work is a collage poem whose inspirations are a Hindu creation myth and a trip to Cambodia. My dream of making one long hanging of a visual text of poetry like the Blaise Cendrars-Sonia Delaunay collaboration called ‘The Prose of the Trans-Siberian and of Little Jeanne of France’ (1913) was limited by the actuality of what I could accomplish. But that was my ideal. The paper used for each collage page was a gift from Linda Oppen, consisting mainly of the hand-dyed tissue papers made by Mary Oppen for her collaged paper-paintings. Mary Oppen left a number of these thin colored sheets at her death in 1990; I have incorporated some of them here. Although I do have an order for these pages (title page and 18 pages of visual text), they may also be unbound. Particularly the 18 pages of collage-poem may circulate in a different order; this would be very idiomatic to the myth and to my sense of the volatility of the cosmological. And to the pain of the historical.